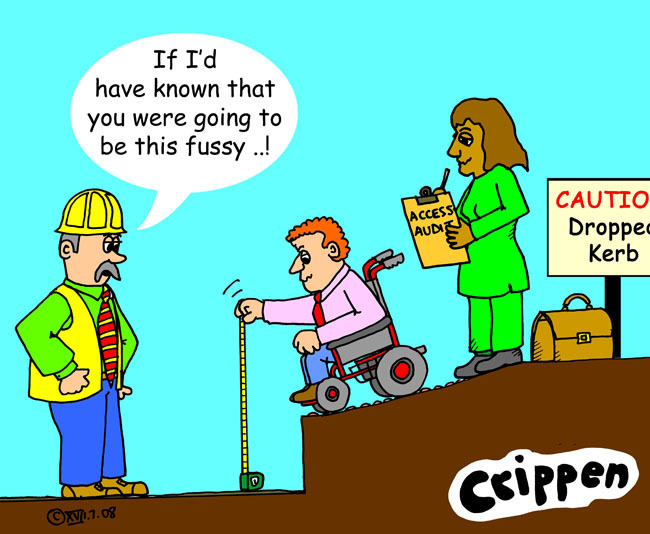 The only down side is that living out in the sticks as we do, the concept of accessibility is virtually non existent (you may remember the tale of a wheelbarrow being used to get a Disabled neighbour down the mountain!). There has been some new-build in the town which has had accessible parking bays laid out in the road in front (this is apparently due to latest European legislation which is slowly creeping into Spain). But this might as well just have a sign on it saying ‘free parking for everyone!’. The last time I tried to park there it had a donkey tied to the signpost and a small tractor and trailer parked on the pavement! We do have local police who are supposed to monitor these bays and I have seen them taking the numbers of people who have parked in an accessible bay without a blue badge. But that seems to be the extent of their involvement. People still park there, and I end up having to park out on the edges of the town and try and clump my way in, in stages! My Spanish is slowly improving and I’m looking forward to the time I can say ‘Sorry mate, you can’t park there unless you’re a Crip’ without getting my tenses mixed up and asking them to disable me! Enlarged image - If you want to see an enlarged version or get a description of any of the cartoons on this blog, then just click on the middle of each cartoon and it will open as a much bigger version along with a description for your software to read.